Hi Harvey, tell us a little about your business and your goals for the future. Carus is a professional painting and maintenance business. We specialise in improving the serviceable life and value of property assets, keeping them shipshape and in prime condition. Our people take care of the areas that aren’t our customers’ specialty – to help them support the future of their property. We have grown significantly over the last four years. With six locations across New Zealand currently, three of them new in the last year, growth is really taking off! Our immediate goal is to solidify a stronger nationwide presence, with the potential for two more new branches in the not too distant future. What has driven the growth of your business over the last 3-5 years? Having a very clear strategic plan has helped with our business. We brought on Leigh Paulden, our business coach, back in late 2015. Leigh has helped us to think about where we want to go – our business goal – and he’s helped make sure our strategies, as well as our brand, are strong and clear. The front end of a business is crucial when you start out. It’s often easy for your focus to go into other areas – ensuring a strong public image, right from the start, would be my recommendation. We haven’t had to reinvent the wheel when we’ve grown into new locations. We’ve employed new people, with our tried and tested systems and processes already in place for our newcomers to align themselves with. What unexpected lessons have you learnt along the way? The power of networking! It’s surprising what comes out of a conversation with someone that is from a completely different industry. It’s always worth taking the time to hear other people’s stories and to tell your story! From your perspective, what creates a fast-growing business? I think you need a clear vison and mission in a successful business. It’s important for all team members to believe in a common goal. 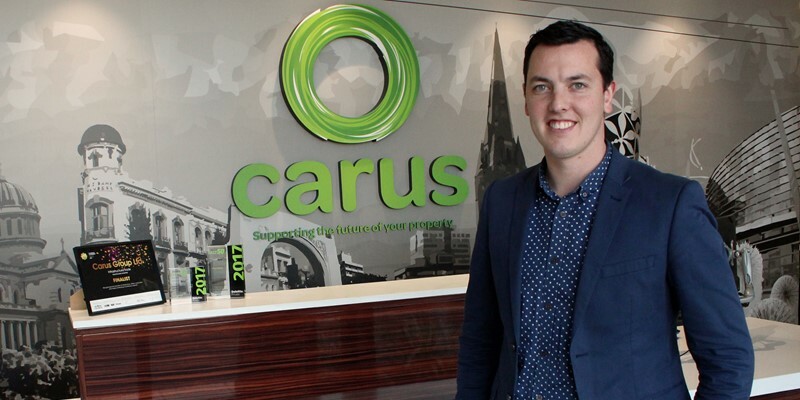 Here at Carus, we have six clear core values. Having pride in our appearance. Caring for others and their property. Our values are always visible in the office, ensuring our people and management alike can see them and keep them top of mind. It’s crucial to have 100% team buy-in for your business to be a success! Why did you enter the Deloitte Fast 50 in 2017? We entered by default actually! We were nominated for the Champion Canterbury Business awards, so I thought about other business awards. I did a quick Google search and saw it was very easy to enter the Fast 50. We thought it would be beneficial to our business for more national publicity and maybe get some recognition for our hard-working team. In reality it was all this and much more! What did being involved in the Deloitte Fast 50 bring to your business – what did you and the team get out of it? Heaps of people have heard about the Fast 50 and know all about it, it’s so well-known! We had one particular customer come to us, just out of nowhere, and congratulate us on the nomination – before we even got the chance to tell anyone. For us, it has helped solidify us as a company – and lets people know we are here with purpose. So many contacts and random messages of support came out of the 2017 Fast 50 – it was fantastic. It’s also good to stop and recognise where you are in the process, and give yourself and your team a pat on the back. The markets we work in are really starting to notice our presence more and more.